Adam Munzert received his B.M. in Music Composition from Christopher Newport University where he studied composition with Dr. Christopher Cook, piano with Prof. Beth Tomessetti and Dr. Jeremy Reger, and tuba Prof. Rodney Martell. He has performed in solo, small ensemble, choir band, and orchestral environments as well as directing musical groups and the performance of his compositions. Because of this array of experiences, lessons focus not only on fundamentals, but also on understanding music in its wider context, both in music and as its broader purpose as a means of human expression. He fully believes that the happiest students are those that understand what they are doing. 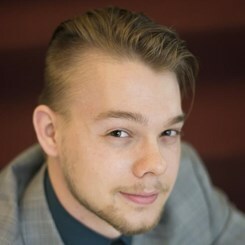 He currently teaches in Northern Virginia area from ages three and up, as well as working as freelance musician, and on his various composition projects. It can be difficult to know a teacher's teaching style from a bio, so I lay out my teaching philosophy here. I tailor the lessons to constantly build up the student. When an aspect is accomplished well, it does not go unnoticed and when there is an element to work on, it is a patient collaboration to help build the students ability and confidence in their skill. Ultimately, the goal is to help the student grow in their understanding of music, and hopefully apply those lessons learned to their understanding of the world and their life as a whole. Request Lessons with Adam Munzert today!